THE SKINNY: I play tennis pretty regularly at lunch, and if I can't get in a quick shower afterward, I rely on Ban Total Refresh Cooling Body Cloths to clean up. Unless you have uber sensitive skin, don't read the ingredients. The list reads like a mad scientists' concoction of various alcohols and other chemicals. But these wipes really do work and leave me feeling refreshed and able to return to work. They take away sweat, cool hot skin, erase redness and leave behind an almost-showered scent. They don't leave my skin sticky or dry or irritated. My only compliant is that the cloths aren't bigger. They're the same size as a makeup wipe, which can be a little awkward trying to wipe down larger areas. Luckily, they're a little damper than the average makeup wipe, so they do get the job done. 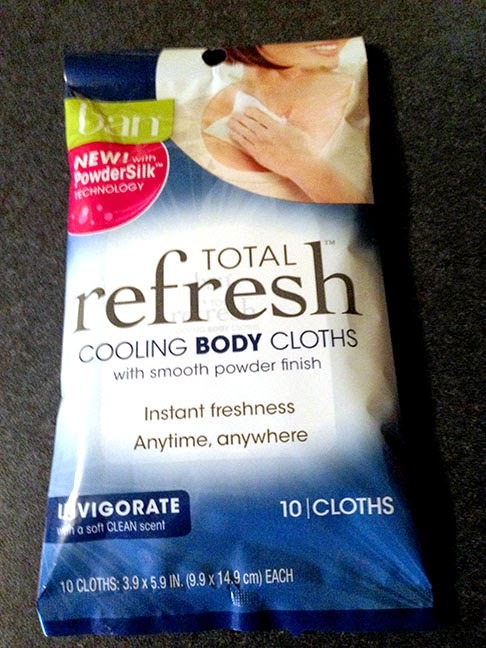 CHECK IT OUT: Total Refresh Cooling Body Cloths are available in three formulas (enliven, invigorate and restore). I don't notice much of a difference among them.